Worlds Best Cat Litter has provided me with a 7lb bag of their cat litter. It is meant to last a whole month for one cat! Don't forget to see how you can get your own free bag to test out! Why Is Smoking On The Rise Despite Anti-Smoking Campaigns and Research? Are you trying to quit smoking? It may seem like an endless battle but there are more reasons to stop then to continue. I know here in the state of NY a package of cigarettes has gone up to over $9 a pack! Including the gas it takes for late night trips to the store, you could be spending $40 a month or more. That could run you a bill of over $400 a year! Of course money isn’t the only factor. 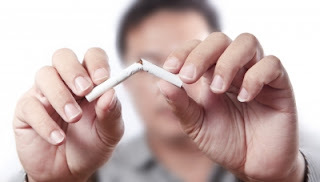 First and foremost you should quit for your health and the others around you! Did you know that children with parents who smoke are more likely to smoke themselves? Not only that but there so many increased health risks to both you and your children. Over 4 million people die each year due to smoke related illnesses. Illnesses that could be avoided! Thanks for joining me for the Fluffy Fourth of July sponsored by Gnome’s Naturals and hosted by Life With Levi! Whether you’re just starting out using cloth diapers or already a fluffy pro, this giveaway prize offers something for everyone. One lucky winner will receive the ULTIMATE cloth diaper stash starter pack, valued at over $415!!! Thank you for joining me for The Ultimate Fluff Stash Giveaway hosted by Daily Mothering and sponsored by Kebbie's Diaper Bag! 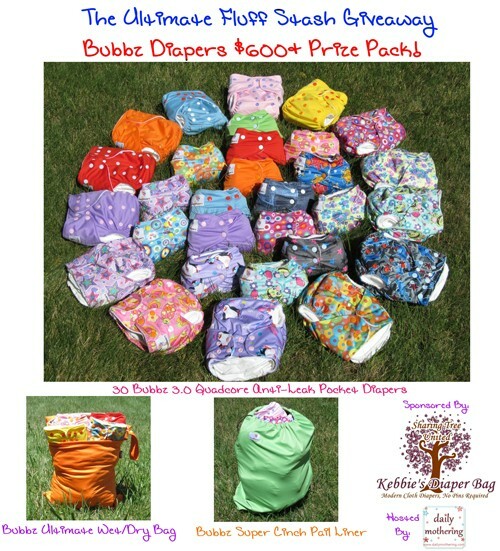 We are giving away a huge cloth diaper prize pack valued at over $600 to one lucky winner! 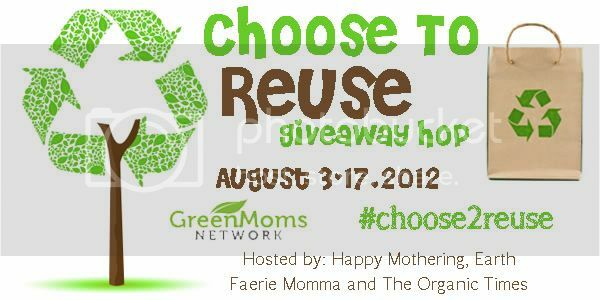 Blogger sign ups are now open for the Choose To Reuse Giveaway Hop! Hosted by: The Organic Times, Happy Mothering & Earth Faerie Momma! When our child is teething, colicky, has a cold or even a diaper rash, we as parents want to know about products that are safe and effective. I am always looking for natural alternatives when my little ones aren't feeling well. That’s why I love Hyland’s! Hyland’s products work naturally by stimulating the body’s own ability to heal. In fact, parents have been trusting Hyland’s products for more than 85 years! Are you looking for natural, organic clothing for your family? Hessnatur has an array of choices. They even have a new baby line...yes, that includes cloth diapers! I especially like the cloth diapers they carry because they are all made of natural material, like cotton and wool. When you are done drooling over diapers, check out the 50% off summer sale that is going on until the end of July. But hurry on over because the good stuff doesn't stick around that long. Hessnatur has the cutest organic cotton and silk dresses! Plus, when you use the code "PAFFSH" you get free shipping and returns! Thanks for joining me for the Summer Celebration Giveaway Hop, hosted by Happy Mothering and Organic Mama through the Green Moms Network! 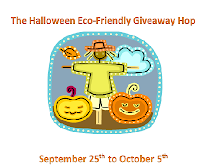 For this event each blogger is offering an eco-friendly giveaway worth $25 or more on their blogs! After you finish entering my giveaway, be sure to hop on over to the other participating blogs, which are listed below the Rafflecopter form. Good luck everyone! Enter below for a chance to win $50 for Lunapads! Yay! Another exciting event hosted by Fabulous Finds and Mama Chocolate! You may remember the last event, Fluffy Butts Cloth Diaper Hop. It was a lot of fun and we had a great turn out. If you are a blogger then come and sign up here. This event is sure to bring in a lot of new traffic. For all my readers, come back between July 30th and August 10th. Each blog will have a giveaway prize worth $25 or more. You will get tons of chances to win some great baby gear. Sign up for my newsletter so you don't miss it! Win the newest, hottest membership to have, The SquareCard from SquareSpot! It provides you with great deals and discounts you cannot get anywhere else. These are exclusive discount codes you can use in store or online. You don't have to live in the specific areas to use these discounts and coupons. Many of them are available over the internet to the whole country!! Enter below to win a membership, worth $50. You won't be disappointed. I am proud to represent a company like this. I was given the opportunity to try their wool dryer balls. I have been wanting to try wool dryer balls for quite some time now. We were given those spikey plastic dryer balls at one point, but when I found out that they could be releasing harmful chemicals every time they were heated in the dryer, I tossed them! Plus, I have been trying my best to find plastic alternatives whenever possible. Read more about the dangers of plastic. If you love your pet now is your chance to treat them to something special! Two Little Cavaliers your favorite place for International Dog News, Pet Product Reviews, Pet Centric Giveaways, dog friendly recipes Cooking for Dogs, and the creator and co-host of the Saturday Pet Bloggers Blog Hop a weekly event where pet bloggers and pet lovers can come together to meet, greet, and hang out is hosting this Giveaway to say thank you to their friends and fans for all of their love and support over the years. RIP to my kitty "Last". About a year ago Amanda Wucher-Aller and Kristin Ward decided to create their own detergent for their families. They wanted something they could use on all their clothes including their cloth diapers. Kristen's husband is a chef, Amanda's husband is in the military and they have four kids between them. So, they needed something that would wash even the dirtiest messes but was still safe for their families and the environment. They researched and put together a non-toxic eco friendly wash. They had friends and family test it out until they had the perfect combination. At the beginning of 2012 the two friends finalized their product and packaging, opening their store "A Happy Green Life." In college Kristin studied anthropology and Amanda studied environmental studies. They are teaching their children that the earth is precious and needs to be preserved. This year they are trying to grow all of their own food in their gardens. When they have extra time, they love to visit the zoo to see the chimpanzees. They love things from nature and individuals instead of big factories. They are passionate about being GREEN! Created by Madeline Shaw is 1993, Lunapads is all about empowering women with cloth menstrual pads (aka mama cloth). "Lunapads' mission is to create more positive and informed relationships between menstruators, their bodies and the Earth." This woman owned and operated business is based our of Vancouver, Canada. I can't tell you how great it is to have the opportunity to work with this company. They make fantastic products and have great customer services. Get to know the team of women behind Lunapads! Just like disposable diapers, female pads and tampons are loaded with toxic chemicals including; plastics, bleach and fragrances. Why would you want that against one of the most sensitive areas of your body? This is the mattress we just tossed after three years. It started to shred like this after only a year of use. Read my Lullaby Earth Mattress Review! Loving Your Pet Giveaway Hop Blogger Sign Ups OPEN! Another great giveaway hop is happening soon. This one is hosted by Two Little Cavaliers. The Loving Your Pet Giveaway Hop is for all things pets. It will take place July 1-14. You can sign up HERE. Happy Mothering, Eco-Crazy Mom and Organic Mama are hosting the Summer Celebration Giveaway Hop, which will run from June 21, 2012 12:01 AM EST to June 29, 2012 11:59 PM EST. The prizes will be anything for summer that is green and eco friendly! It is going to be a lot of fun. There are over 30 blogs participating so far. Click here for more information and to sign up! The Green Moms Network brings you this great event. It is going to be a lot of fun! I am all for Eco Friendly and Made in USA! Sarah, a stay-at-home mom, enjoys sewing and creating. After starting to cloth diaper her children a little over a year ago, she decided to put her experienced sewing skills to work. So, she made diapers and accessories herself. She enjoyed making bags the most and started sharing them with friends. She received such great feedback, she created Loving O.Z. a place to buy wet bags and more. She gets encouragement and support from her loving husband and is able to work from home. She relaxes by spending time with her husband and two children, Olivia and Zachariah . She also enjoys shopping, blogging, scrapbooking and organizing. Shop Loving O.Z. After the birth of her twin girls, Dallas, came to love cloth diapers. One of her girls ended up with very sensitive skin. Dallas wanted desperately to continue with cloth. After trying several commercial detergents with no success, she decided to make her own. She came up with a recipe that is safe, good for sensitive skin, avoids build up and is cost efficient. She knows it works because she uses it herself. She started Little Love Buns to share her creations. Her children, husband and faith are what drive her to do the best she can. Dallas is an easy going, hard working woman. When she has a moment to spare she spends it with her family. Kimberly was kind enough to sponsor another event. Read my other review on her colorful toys! Kimberly, a homeschooling mother to five kids, has enjoyed tie dying for herself and her family for quite some time. Just recently, she and her mother Becky (who does the sewing) joined forces to bring you Happy Yiayia. Kimberly has done what most of us can only dream about, create a business out of a hobby. She enjoys the anticipation and excitement from hand dying each piece and waiting to see how it turns out. Then she is able to share it with the world. She feels it is important that her children see her take time for herself and do something she enjoys and I couldn't agree more! When Kimberly isn't working or teaching her children she is spending time outside hiking, swimming, camping or just hanging out with friends and family. FREE Blogger Sign Ups For The Hot Fluff Cool Baby Giveaway! Welcome cloth diapering bloggers! Sign ups are now open for the Hot Fluff Cool Baby giveaway event! We are giving away a $300 cloth diapering prize pack from Greenie Beanie Bottoms! Visit Just Add Cloth and sign up for this free event! The only requirement is 500 facebook fans and a family friendly blog.